« When do you workout? For the past week or so I have been working on a new crafty project. My son is obsessed with cars, trucks, vans, etc. VEHICLES rule his world. We cannot leave the house without cars in tow. 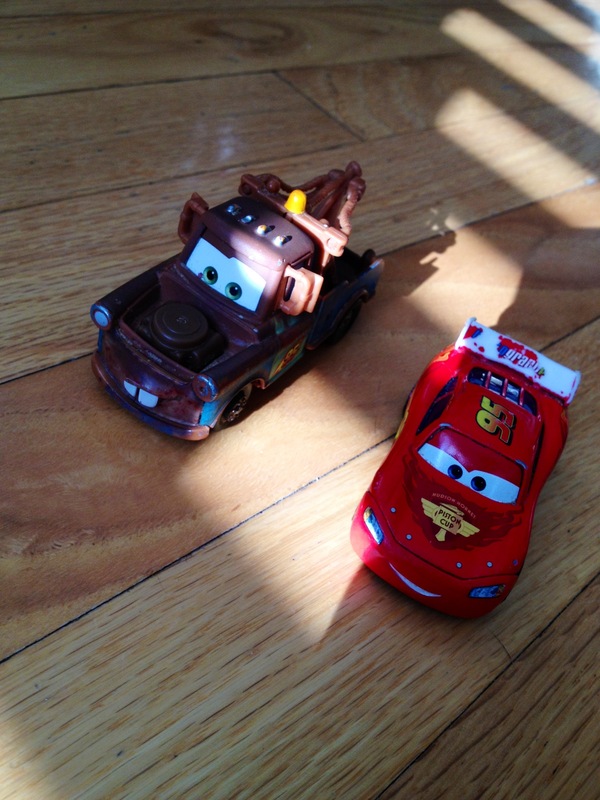 In particular we cannot leave without Mater and Lightning McQueen. As you can see, Lightning in particular is rather loved. He is in need of a fresh paint job. I can bring along other cars. He will play with them sure, but only if he also has Mater and Lightning. If I do not have both of them he will shake his head no and point at my purse over and over until he gets the right cars. If he doesn’t get the right car, prepare yourself for a meltdown! So my kid’s lovies are two cars. Not a blanket or a stuffed animal but metal/plastic cars. Always in his hands. He has even managed to master being able to hold them both and pick up other objects. Now that you have the background back to my project. 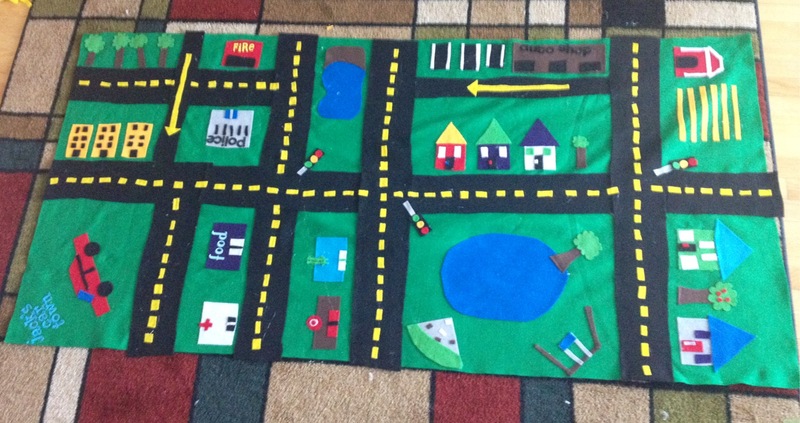 I made him a car mat. For him to play with and drive his cars around his town. He has started to drive them around things and make a car sound. I figured it was time for him to have roads to play on. I made it from felt. I hand cut all of the pieces. I mean it is not perfect scale or size etc. But I think that adds to the charm of it. The words are actually scrapbooking letter stickers I had. I hot glued everything down. Even the letters.The cutting and the layout took a while. I created it all before gluing anything. Made sure it looked how I wanted. I then ran out of hot glue one evening this week while he was sleeping. He was super cranky all week so we didn’t make it to the craft store until Thursday. I didn’t have the time or energy to finish it until yesterday during nap time. It took me a couple hours to glue it all down. At least 2 hours for sure. Maybe longer. I sort of lost track of time. Thankfully we had been at the beach/park/spray park all morning and he took a long nap. He did love it! I showed him how to drive his cars on the road and he picked up on it pretty quick. When he saw it he immediately tried to pick one of the lakes up off of the mat. It cracked me up because it was glued down and he was a little confused. I have been contemplating making him a felt board. With felt shapes to stick on it. Now that I saw him do that with the mat I will be making that board.